Cincinnati, Ohio has historically been at the forefront of the fight against hunger, this tradition starting with “penny lunch” programs in the early 1900s and more recently with universal free breakfast for public schools. Since its founding in 1991, Matthew 25: Ministries has been a big part of this tradition, fighting hunger both in the United States and other countries. Based in Blue Ash, Ohio the charity is dedicated to helping those in need, whether it is disaster victims in Joplin, Missouri or earthquake-devastated Haiti. Matthew 25: Ministries even has its own food processing center which makes a special rice/soy blend. Around 1 million meals of this food were sent to Japan to help victims of the earthquake and tsunami that struck there last year. Matthew 25: Ministries recently completed a Fighting Hunger Food Drive in Cincinnati which was kicked off by a 5K Road Race. In the United States one in 6 people are suffering from hunger according to studies by Feeding America. Matthew 25: Ministries is on the front lines taking on this growing hunger crisis. Let’s find out how in this interview with Joodi Archer, the organization’s media relations director. How many food pantries does your agency support year round? We work with the majority of our food pantries during our Fighting Hunger 5K. Last year, we served approximately 40 pantries and shelters during that time. We do work with some pantries and shelters on an ongoing basis throughout the year depending on the quantities and types of food we have donated to us – most of these pantries would also benefit from our Fighting Hunger Food Drive. Matthew 25: Ministries is committed to serving the needs of Greater Cincinnati during the holiday season and throughout the year. Is most of your support to the pantries in the form of canned goods or rice/soy blend you produce? For our 2011 Fighting Hunger Food Drive, approximately 20,000 pounds of the 60,000 total pounds of distributed food consisted of our rice/soy blend. Throughout the year, approximately 25% of the total pounds of locally distributed food could be our rice/soy blend. Are you seeing a greater need for assistance from food pantries in the area? The need for assistance is escalating at a significant pace, mirroring the downturn in the economy and continuing high unemployment rates. Pantries are reporting double and triple the requests for assistance and are struggling to meet the needs of recipients. The pantries we provide for often serve hard-to-reach, non-mobile populations, and they are struggling to meet the increasing requests for assistance. How can someone get involved with Matthew 25? 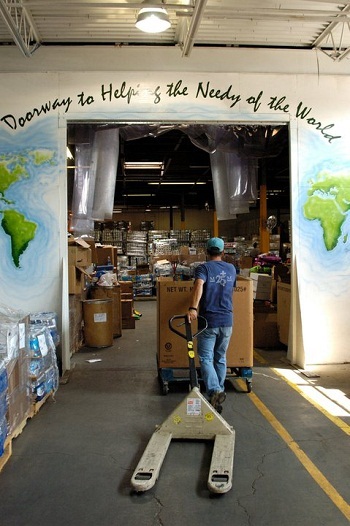 Volunteer: Matthew 25: Ministries is always in need of volunteers at our 132,000 square foot warehouse in Blue Ash, Ohio. Opportunities exist for individuals, families, and groups of any size. (Please see our volunteer guidelines for more information.) For groups located outside of the Greater Cincinnati area, Matthew 25: Ministries provides a great opportunity for day-long volunteer trips or overnight multiple-day trips. Please call 513-793-6256 for more information and for help with scheduling your visit. Contribute: More than 99% of Matthew 25: Ministries’ cash and in-kind donations go towards programs. In 2011, for every $1 donated, Matthew 25 distributed $64 in humanitarian aid. That means that even a small gift will have an enormous impact on the lives of those in need. Collections: Collect products and goods for the poorest of the poor. This is a great way for groups such as schools, businesses, clubs, etc. to help. We are always in need of clothing, personal care items, non-perishable food, medical supplies, and educational materials. Contact Matthew 25: Ministries for suggestions of critically needed items. Fundraise: Host a spaghetti dinner,auction, or concert. Make Matthew 25: Ministries a part of your church’s mission budget, mission Sunday, or special collection. Raise money as a general donation or to support a specific project. For example, a small but sturdy house in Nicaragua costs about $1,300. One M25M donor spearheaded enough fundraising activities to pay for the construction of twenty-two houses-each with a cement floor, solid door, shuttered windows, and waterproof roof! Ask M25M for assistance on fundraising ideas or promotional materials. Pallet to the Poor: Sponsor a pallet of goods to send to the poor. A four-foot by four-foot pallet costs $192 and typically contains about $4,200 in products and supplies. Each pallet is labeled with the name of the sponsoring individual, group, or organization. A letter of acknowledgment and thanks lets the donor know where the pallet of products is going. Contact Joodi Archer for more information on the Pallet to the Poor Program. Connect: Introduce a potential corporate donor to Matthew 25: Ministries. Your phone call or e-mail connecting Matthew 25: Ministries to the correct contact individual can save weeks or months of research to establish a connection. Corporate donors receive many benefits from partnering with Matthew 25: Ministries including substantial tax benefits. See our Corporate Partners section for more information. Visit Matthew 25:Ministries to learn more. Article first published as Fighting Hunger: An Interview with Joodi Archer of Matthew 25: Ministries on Blogcritics.